Charlemagne (Karolus Magnus, Karl der Große) died on 28 January 814 at Aachen. He is buried in Aachen Cathedral. Karl, from the Carolingian family, was born on 2 April, either in 747 or 748. Nor do we know where he was born. Aachen and Liège are possible, but other towns have also been suggested. His parents were Pepin the Short and Bertrada of Laon (history has given her the rather unflattering nickname ‘Bertrada Boadfoot’). After Pepin’s death on 24 September 768, the realm was divided between his two sons, Karl and Karlmann (Carlman). The relationship between the two kings did not go smoothly. Then Karlmann suddenly died on 4 December 771 of natural causes. Karl seized the whole realm, which he extended during a number of wars. On 25 December 800, he was crowned Holy Roman Emperor by Pope Leo III in Saint Peter’s Basilika in Rome. This was the beginning of the Holy Roman Empire, which lasted until 1806. Traditionally the story went that the Pope unexpectedly put the crown on Karl’s head, while he was praying. However, modern research has shown that this romantic version is highly unlikely. As the position of the Pope was fairly weak, it was probably Karl himself who sought the honour. Under Karl, the Carolingian Empire was at its largest and most powerful position (the extent is shown on this map on Wikimedia Commons). After his death, Karl was buried in Aachen Cathedral. He was succeeded by his only surviving son Ludwig (Louis). 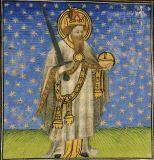 More information on Charlemagne from Encyclopaedia Britannica. This entry was posted on Monday, January 28th, 2019 at 6:00	and is filed under Events in History. You can follow any responses to this entry through the RSS 2.0 feed. Both comments and pings are currently closed.